The popularity and consumption of conventional yogurt, higher protein yogurt, and yogurt beverages continues to grow as consumers crave the great taste, creamy texture and wellness benefits. 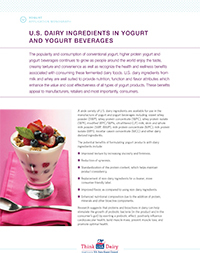 This 20-page monograph outlines U.S. dairy ingredients' functionality advantages in yogurt and yogurt beverages alongside sample formulations for innovation inspiration. There is also a Q&A section with answers to common questions.